Got back from the motherland yesterday morning, still a little jetlagged and bleary. I expected my month in the states to be a World Cup-free experience, but to my surprise soccer does seem to be taking off - a bit - in the states. Of course, it'd take off a lot faster if we didn't play so dismally, but, even so. I watched part of the USA-Italy match crowded around a tiny tv during a wedding reception with a room full of unexpectedly into-it soccer fans (the mother of the bride kicked us out around halftime because they needed the space for pictures) and even in rural Vermont, it wasn't hard to find bars showing the games. It's always been big in New York, probably because of the huge immigrant population, but lately soccer seems to have become the cool sport to follow in media circles. Still, I was more interested in watching the Carolina Hurricanes beat the Edmonton Oilers in the action-packed Stanley Cup finals (that's ice hockey, folks.) I didn't want to go nuts watching football over there because I knew that when I got back to blighty it'd be football city morning noon and night. "WORLD CUP SHOWN HERE. WATCH THE MATCH WHILE YOU WAIT." Throughout the World Cup, the Residents' Lounge will be screening all the major games so you can enjoy the tournament in luxury. You will receive first class table service throughout the game so you need not miss a minute of action! Watching the match in luxury seems somehow wrong, though. Don't you have to be in a pub full of sweaty, shouting blokes clutching pints of lager? 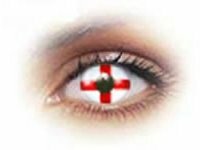 Oh, and the picture is actually England flag contact lenses. No joke. I thought it was just me. It seems like there are a lot more people paying attention to the cup this year. Unfortunately, I think these folks are "World Cup fans" rather than "soccer fans". I'm guessing ESPN's ratings for Champions League matches, Fox Soccer Channel's ratings for EPL matches and ABC's ratings for the MLS Cup will all remain close to what they were before the cup. Then again with all of those matches on TV these days, how much bigger do I really need soccer to be in the US? If you are a soccer fan in the US, there's already a lot of good soccer on TV.